There have been 6 efficiency units sold in this building in the last 12 months. The last unit in this building sold on 2/27/2019. Click here to get the details of all closings in the last 12 months. DonÃ¢Â€Â™t miss out on owning a unit in Coral Beach Resort in the heart of Myrtle Beach! This resort is finishing a multi-million dollar renovation, and looks like a brand new upscale property. Coral Beach provides numerous onsite amenities: indoor and outdoor pools with lazy river, sundecks, indoor and outdoor snack bars, lounges, Starbucks, restaurants, fitness center, gift shop, bowling alley, arcade and conference/meeting rooms. This efficiency has brand new carpets, updated furniture and kitchen along with an amazing ocean view to wake up to in the morning and beautiful sunsets from your balcony at night. Coral Beach offers live entertainment and activity programs during the peak months to keep you and your guests entertained. 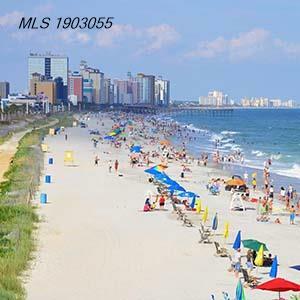 The resort is conveniently located near the airport, as well as the other attractions that draws millions to the Myrtle Beach area year in and year out: Broadway at the Beach, Restaurants, Shopping, Golf Courses, Barefoot Landing, and many more exciting Ã¢Â€Âœmust seesÃ¢Â€Â. Come visit to check out this resort, unit and beach that you can call your home away from home! Electric Common,Water and Sewer,Trash Pickup,Elevator Service,Pool Service,Landscape/Lawn,Insurance,Manager,Security,Rec. Facilities,Master Antenna/Cable TV,Common Maint/Repair,Other,Single Level,Carpeting,Tile,Smoke Detector,Oceanfront,Ocean View,Double Sink,Lvr/DR Combo,Central Air,Electric,Slab,Other,Cable TV,Electricity,Sewer,Telephone,Refrigerator,Range,Microwave,Stainless Steel Apps.